2009 Buckskin Mare AMHR 32"
This beautiful young daughter of Buckeroo is one of the last of her kind. She has had 2 very nice fillies and sells with a breeding to In Cahoots! 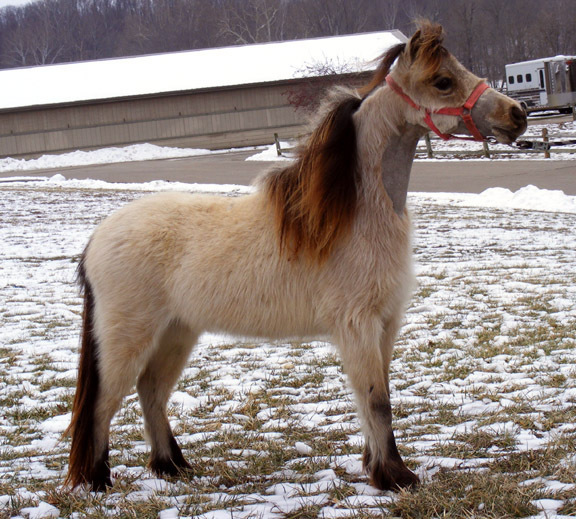 A beautiful Shetland Mini cross. Her dam goes back to Johnstons Starlight Ranger and Gold Melody Boy. This filly is ready to show. Exclamation is just 5 years old and has produced 2 beautiful fillies. She sells with her 2018 bay pinto filly sired by Wa-Full Unique Waylon. Exclamation is bred back to Waylon for 2019 and sells with a LFG. She is easy to handle and a great broodmare. Delicate and pretty! This filly has Call me Sir and several crosses to Buckeroos Top Cat in her pedigree! She has lots of show presence. Ready for the ring. Ready for the show ring.! This filly has great balance and presence. She has what she needs to win consistently under all types of judges, great legs, beautiful face and square proportion. Dontcha is a sweet pony mare. She was shown as a Cobtail Harness Pony and won many times. She has had 2 fillies and is currently open.